Stain resistance for easier care. Heat resistant up to 500 degrees. Dual sided silicone treatment for an easier grip on hot cookware or bakeware. Reinforced thumb area made of fire resistant fibers. Made of 100% heavy cotton. Measures 6.5 by 14 inches. Variety of colors to fit any kitchen style. Established in 1892, the John Ritzenthaler company (Ritz) has long been synonymous with the finest quality in home textiles. Today, the John Ritzenthaler company is a privately owned manufacturer, wholesaler and distributor of a complete line of high quality, color coordinated, fashion basic and designer bath and kitchen textiles, as well as, specialty laundry and cleaning aids. As a leader in the home textiles category we are experienced in working on Ritz initiated design concepts, licensed designs and also with interpreting customer requests into new products. Our marketing and design teams work closely together to identify product opportunities within the marketplace to help create the right product mix for our customers. HEAVY WEIGHT TWILL AND SILICONE. 100% cotton heavyweight twill treated with silicone on both the front and back, for both right or left handed use. Silicone gives a sturdier grip while heavyweight twill give flexibility added bulk. LEFT OR RIGHT HANDED. Treated with silicone on both sides for right or left handed use. HEAT RESISTANT. 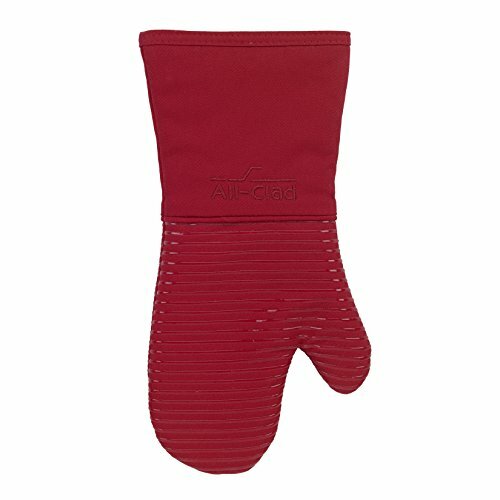 Heat resistant up to 500 degrees and having a reinforced thumb area made of fire resistant fibers means your hands will be protected when grabbing hot items from the oven or grill. EASY CARE. Machine wash cold with like colors on gentle cycle, only non-chlorine bleach when needed and lay flat to dry. Cotton twill is stain resistant. LONGEVITY AND QUALITY. Ritz has partnered with All-Clad Metalcrafters LLC, a professional, premium cookware manufacturer, to develop and produce a high quality textiles line to complement your home kitchen. If you have any questions about this product by All Clad Textiles, contact us by completing and submitting the form below. If you are looking for a specif part number, please include it with your message.